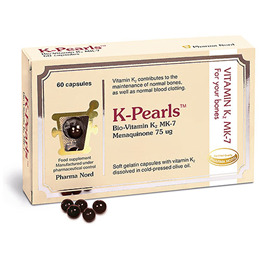 Pharma Nord K-Pearls contain 75mcg of pure vitamin K2 (Menaquinon MK-7) in each capsule. The vitamin K2 is dissolved in cold-pressed olive oil to improve the absorption. Vitamin K2 supplements from Pharma Nord are dissolved in a cold-pressed olive oil suspension in small, easy-to-swallow “pearls” of soft gelatine. Vitamin K2 is a fat-soluble vitamin which is important for the maintenance of normal bone health, cardiovascular health and normal blood coagulation. Being active in the body for longer than vitamin K1; vitamin K2 is able to reach more tissue and activate proteins that have a role in keeping calcium mobile. As Vitamin K is so important for bone health, it makes sense to take a vitamin K2 supplement as part of your daily supplementation programme especially if you are postmenopausal. Vitamin K belongs to the group of fat-soluble vitamins together with vitamins A, D and E. K-Pearls is all-trans form, making it biologically more active. Bulking Agent: Olive oil (cold-pressed), Capsule Shell: Bovine Gelatine, Humectant: Glycerol, purified water, Vitamin K2 (menaquinone-7), Colour: Iron oxide. 1 capsule per day, or as directed by a physician. Capsule can be chewed or swallowed whole. People prescribed warfarin should seek medical advice before taking supplemental vitamin K2. Below are reviews of Pharma Nord K Pearls - 60 Capsules by bodykind customers. If you have tried this product we'd love to hear what you think so please leave a review. 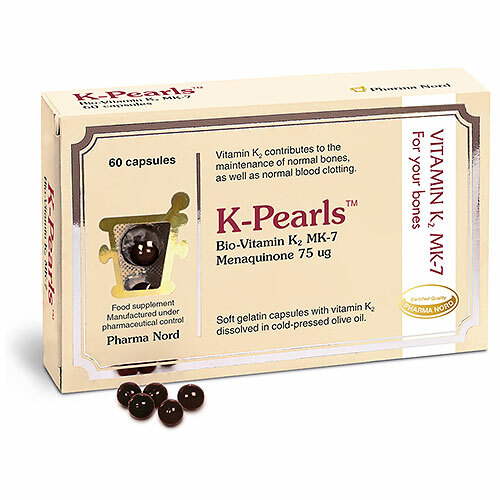 K-Pearls contain 75mcg of pure vitamin K2 (Menaquinon MK-7) in each capsule. The vitamin K2 is dissolved in cold-pressed olive oil to improve the absorption.